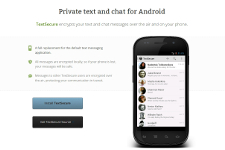 TextSecure from Open WhisperSystems offers full end-to-end encryption for text messaging to other TextSecure users. It replaces the the default text messaging application and all messages are encrypted locally so if your phone gets lost your messages will be unreadable. It uses the data network when available and would therefore be free over wi-fi. If unavailable it uses the SMS network in which case messages would not be encrypted. You can also set-up encrypted groups and have private conversations with many contacts at once. Grab the free app here.